Hobie Bream Series report from Mooloolaba, Queensland. The overall winnner of the Mooloolaba event was Scott Bryant, who took away prize money of $570. 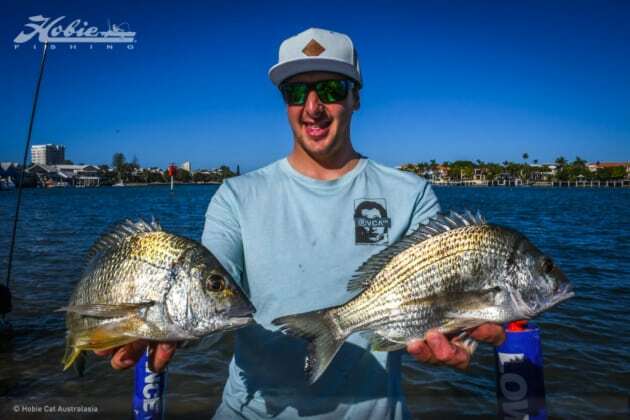 Tackle Tactics TT Lures round 10 of Hobie Kayak Bream Series 9 was battled out on the Mooloolah River in Mooloolaba on Queensland’s Sunshine Coast. The “One Day Wonder” saw anglers from Queensland, the Australian Capital Territory, Victoria and New South Wales compete for cash prizes, sponsor prize packs and Angler of the Year points. Some anglers struggled through pre-fish, while others found fish all over the arena. On both pre-fish and competition days the weather was sensational and the location stunning. Winter days don’t get much better than they were in Mooloolaba but the clear water made it a tough fishery, with easily spooked fish calling for stealth and finesse. Most reports from anglers were that the bite was much tougher on competition day, and everyone had to work hard to attract legal sized bream. It seemed like a different waterway to the pre-fish day and while bream, were tough to locate and catch, there was plenty of bi-catch, including some big trevally and even a massive grouper or two. Those who knuckled down and slogged it out found rewards in their persistence and adjustments to strategy. The top 5 anglers shared total cash prize payout of $1,350 and over $1,250 in sponsor prizes were shared by Open and other divisional winners. For a full report of all the winners, click HERE. Mitch King from Victoria took out second prize.